Abraham Solomon was an English painter who was born on 7th May, 1823 at London, England. Abraham Solomon was born to a manufacturer of leghorn hat, Meyer Solomon and Catherine. He was born at the Sandys Street, located at Bishopsgate, which is located in East London. Abraham Solomon’s father, Meyer Solomon, was one of those first Jewish individuals, who got an admission to the freedom of the London city. Amongst all the other family members of Abraham Solomon, two other members, apart from Abraham Solomon, established themselves as an artist. Simeon Solomon, the younger brother of Abraham Solomon, claimed his position of being an associate to the Pre-Raphaelites. Simeon Solomon also exhibited his paintings from the year 1858 to the year 1872 at the Royal Academy. Later in Simeon Solomon’s life, he did many drawings of heads which are idealised based on crayon. These drawing of Simeon Solomon are yet now popular amongst other artists and individuals. In Bloomsbury, when Abraham Solomon was 13 years old, he joined the Sass’s school of art as a student of the institution. In the year 1838, Abraham Solomon did a drawing of a statue. For this work, he earned at the Society of Arts, the Isis Silver Medal. In the year 1839, Abraham Solomon took admission at the Royal Academy as a student. In the same year, that is 1839, he did a drawing based on the antique. For this work, Abraham Solomon earned the silver medal. In the year 1843, Abraham Solomon decided to do a painting from the life. This work of Abraham Solomon earned him once more a silver medal. Abraham Solomon got married to Ella, who is the sister of Dr Earnest Hart. The marriage of Abraham Solomon and Ella took place on 10th May 1860. In the year 1862, two years after his marriage with Ella, he was selected to be an associate of the renowned Royal Academy. However, Abraham Solomon suffered a heart disease at the very young age of 39 and died on 19th December 1862 at Biarritz in France. In the year 1840, Abraham Solomon’s work took part to be his first work which was a part of an exhibition. This work was the “Rabbi Expounding the Scriptures”. This work of Abraham Solomon appeared in an exhibition which took place in the Society of British Arts. In the year 1841, Abraham Solomon sent two of his paintings to the Royal Academy. These paintings were “My Grandmother” and “Sir Walter Scott’s Fair Maid of Perth”. Abraham Solomon had a lot of paintings exhibited since then in the successive years. These paintings were scenes from the “Vicar of Wakefield” in the year 1842. This was followed by the scene from “Crabbe’s Parish Register” in the year 1843. Next was a scene from the “Peveril of the Peak” in the year 1845. Abraham Solomon’s works or paintings further kept on publishing, marking a growth in his career as a painter. A scene from the “The Breakfast Table” was one of Abraham Solomon’s paintings which were exhibited in the year 1846. This was followed by another painting of Abraham Solomon, which is another scene from the “Vicar of Wakefield” in the year 1847. All these paintings of Abraham Solomon through all the successive years caught a lot of attention. Abraham Solomon then published two of his paintings, which had a brilliant contrast of colours and also portrayed a careful study on the costume. The first work based on this by Abraham Solomon was “A Ball Room in the Year 1760” in the year 1848 followed by “Academy for Instruction in the Discipline of the Fan, 1711” in the year 1849. These were followed by an exhibition which was held at the Royal Academy in the year 1850. In this year 1850 at the exhibition of Royal Academy, Abraham Solomon contributed to the exhibition his painting, the “Too Truthful”. 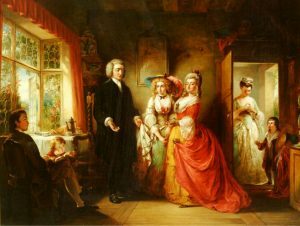 He again contributed to the Royal Academy in the year 1851, his painting “An Awkward Position- An Incident in the Life of Oliver Goldsmith”. Abraham Solomon then sent two of his paintings, the “Scandal” and the “La Petite Dieppoise” to the British Institution in the same year 1851. In the year 1852, Abraham Solomon contributed again few paintings to the Royal Academy. These paintings were, “The Grisette” and a particular scene from the “Moliere’s Tartuffe”. Followed by this, again in the year 1853, the contribution was a painting of from the “Spector”, “Brunetta and Philis”. The last work of Abraham Solomon was “Art Critics in Brittany”, which was published at the British Institution in the year 1861. This was followed by the last painting of Abraham Solomon, the “Departure of the Diligence at Biarritz”. This painting of Abraham Solomon is yet now present at the Royal Holloway College, which is located in Egham, England.